LOADING: Moving can be extremely stressful (even for the customer!) We counter that with respect for your property and a practical approach throughout starting with a loading strategy. Bulky "white" goods, furniture and boxes are loaded first forming a strong bulkhead to protect goods which go behind with flat and breakable items on top chocked in by soft items. No loading "as it comes" nonsense. We do the loading because we know the van but feel free to get involved if you insist! TRAFFIC SAVVINESS: Not driving before 10am, intended to avoid the morning mayhem, enables the stamina to work beyond midnight if needed. (Late moves welcome!) 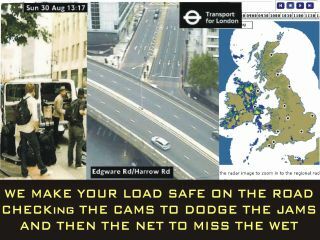 Knowledge of streets and traffic flows, leaves the congestion to the Satnav lemmings. Checking the Met Office rainfall animation and the BBC Jamcams may result in timings being mutually adjusted to avoid getting soaked or gridlocked!!! Also we relate to traffic and parking problems when booking moves. NO TIME STRESS: Allowing time between moves avoids rushed situations and we phone on the run up to a move to key in how soon we will arrive. "More haste less speed" as both loading and driving are paced rather than rushed.... and it works! NO HYPE: No uniforms. We input from our minds to focus on your move, not ourselves. Some movers target and profile certain customers based upon their heritage or lifestyles. Who you are and how you live is none of our business and privacy and respect unfortunately cost nothing. If it did we would charge you for it.